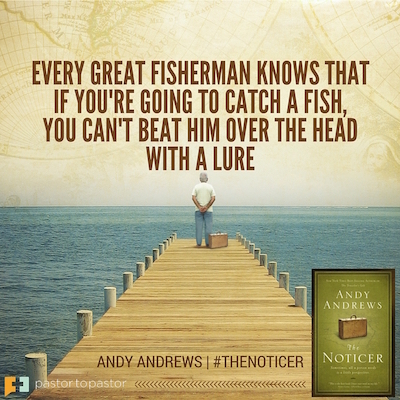 This summer, we at ChurchSource are encouraging pastors and church leaders nationwide to adopt Andy Andrews’ book The Noticer as a summer read for their congregations. Instead of taking the summer off from small groups and Bible studies, why not spend some of that vacation time reading a book that will challenge and uplift your faith? A sermon outline and small group discussion questions will be provided for free to reflect on the message when regular church activities resume in the fall. The Noticer takes place in Orange Beach, Alabama. It is a simple town filled with simple people. But they all have their share of problems – marriages teetering on the brink of divorce, young adults giving up on life, business people on the verge of bankruptcy, and many other obstacles that life seems to dish out. Fortunately, when things look the darkest, a mysterious old man named Jones has a miraculous way of showing up. Jones is a unique soul with angelic-like qualities. Communicating what he calls “a little bit of perspective,” Jones explains that he has been given a gift of noticing things about life that others miss. In his simple interactions, he speaks to that part in everyone that is yearning to understand why things happen and what they can do about it. In this issue of Pastor-to-Pastor, Andy Andrews shares his heart for the church and how his book is changing the perspectives of readers of all ages. He will also talk about the message of The Noticer for a special church leadership edition of his In the Loop with Andy Andrews podcast next Monday, April 11th. ChurchSource: Why do you think The Noticer is a good fit for churches? Andy Andrews: Things are changing drastically. We live in an odd time. When I was growing up, you could have a volleyball game on the beach with your youth group, and afterwards you could put your arm around somebody and say, “Do you have a relationship with Jesus Christ?” And you could have a great conversation with them about that. I think people are misinformed about why that doesn’t work as well as it used to. People believe it doesn’t work because there are some kind of tolerance laws or some new opposition to the church. But that’s not really why it doesn’t work. The real reason it doesn’t work anymore is because we live in a time where there is so much information. From the internet, from television, from radio, from people. So, people believe they are better informed, and they’ve already made up their mind about what they think. But the great commission has not changed. The book is based on Biblical principles but doesn’t overtly talk about Jesus. I’ve found this extremely effective to reach the lost with the Gospel. We Christians talk a lot about being fishers of men. And every great fisherman knows that if you’re going to catch a fish, you can’t beat him over the head with a lure. If you do, he’s just going to run away and you’re not going to catch him. You have to put it out there and make it look great. Because it’s not just good—it’s great. In fact, it’s the best news the world has ever known. ChurchSource: Why do you feel personally called to grow the local church? Andy Andrews: The statistics show us that out of all the people that make a commitment to Christ 98% of the time someone else was involved. Somebody invited them to something, somebody asked them to read something, somebody had a conversation with them. Know what that tells me? Local church is still the place where 98% of people are coming to Jesus. And that’s reason enough to care deeply about it. ChurchSource: Jesus frequently used parables to provide perspective. What benefits have you seen in using the parable form today? Here’s why: I know if I were more overt, many of the non-Christians who have loved the book would’ve put it down as soon as they saw it was about Jesus. Only the Christians would be reading it. And that doesn’t do much to further the great commission, does it? So, by engaging people in a story, both Christians and non-Christians read it. Christians will read it and totally understand the message, and then they’ll give it to non-Christian friends who will get caught up in the story and get exposed to the principles. Something beautiful has happened because of this story: A curriculum is being taught on this book in public schools and universities. There are thousands of teachers using our book from kindergarten to 5th grade all the way up to university programs. But the amazing thing is it is being taught in public schools. What they don’t seem to understand is, to those people, it’s not a Christian book. Even though the principles are straight out of the Bible, it’s just a book with great insight to them. So it’s having a profound impact outside of the church. It’s amazing to see how a powerful parable can find its way into places a more direct message never could. ChurchSource: How does your personal story play into The Noticer? Andy Andrews: My parents died when I was in my mid-twenties, leaving me homeless. The first chapter of The Noticer is the story of how I was living under a pier and a curious, old man found me. He started talking to me and changing my thinking and shifting me and influencing me—and that’s how I was eventually able to crawl out of my broken situation. ChurchSource: What do you hope happens through this summer church program? Andy Andrews: My hope is that Christians can give their non-Christian friends a book grounded in Biblical principles that they will actually read. Because as much as I love a lot of our great Christian leaders, we all have friends that if we give them a Christian book, they’re just not going to read it. I believe this campaign will help us bring about powerful, life-changing conversations between Christians and non-Christians. Be sure to join Andy Andrews on Monday, April 11th for his special church leadership edition of his In the Loop with Andy Andrews when he talks about The Noticer and how it’s message can impact your church and community. 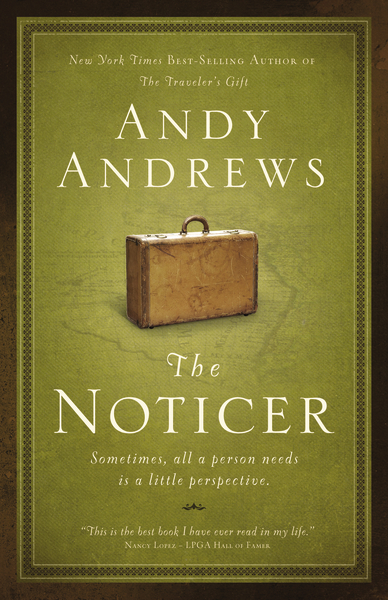 The Noticer is a unique narrative blend of fiction, allegory, and inspiration in which Andy Andrews helps us see how becoming a “noticer” just might change a person’s life forever. Perfect for small groups or a church-wide summer reading program, The Noticer is a powerful book grounded in Biblical principles with a story that will inspire life-changing conversations. To learn more about connecting your whole church with a “Summer of Perspective,” click here to learn more about The Noticer summer reading campaign with free discussion guides, sermon outlines, bulletin inserts, and more.